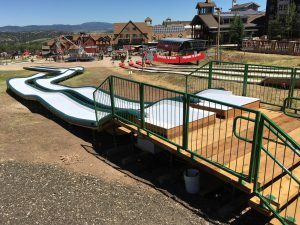 Park City Mountain Resort installed a pair of mSnow Kid’s Tube Slides with exciting fun rollers and banked turns for the summer of 2016. This exciting summer tubing setup was specifically designed for the very young participants at this location! We also engineered and built them a beautiful portable starting deck featuring durable powder coated steel hardware and rough sawn cedar decking. Summer tubing would have been very difficult -if not impossible – in this compact location without the use of a starting deck and our special Tube Slide elevating hardware.